I am doing research on St. Thomas in India and have learned that your office issued a letter on November 13, 1952 which stated that the landing of St. Thomas at Cranganore in 53 A.D. is unverified. I would like to know if in fact the said letter was issued and, if that is not the case, whether you can confirm that St. Thomas was martyred and buried in Madras. I would be most grateful if you could direct me to any authentic evidence supporting the story of St. Thomas in India. 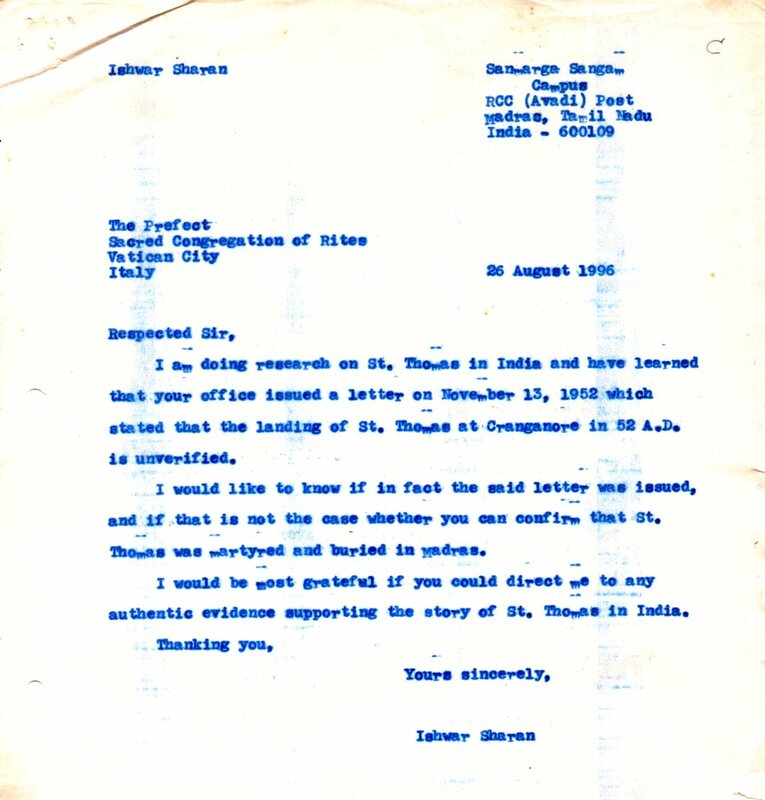 This Congregation for the Causes of Saints has received your letter of 26th August last in which you have asked for information regarding Saint Thomas’ presence in India. We have not found in our Archives the letter supposedly written by this Congregation on 13th November 1952, of which you speak, because of a lack of more precise data (diocese, destination, etc.). Nor do we have other data regarding Saint Thomas since this Archive was begun in 1588. His life is the object of the research of historians which is not the particular competence of this Congregation. 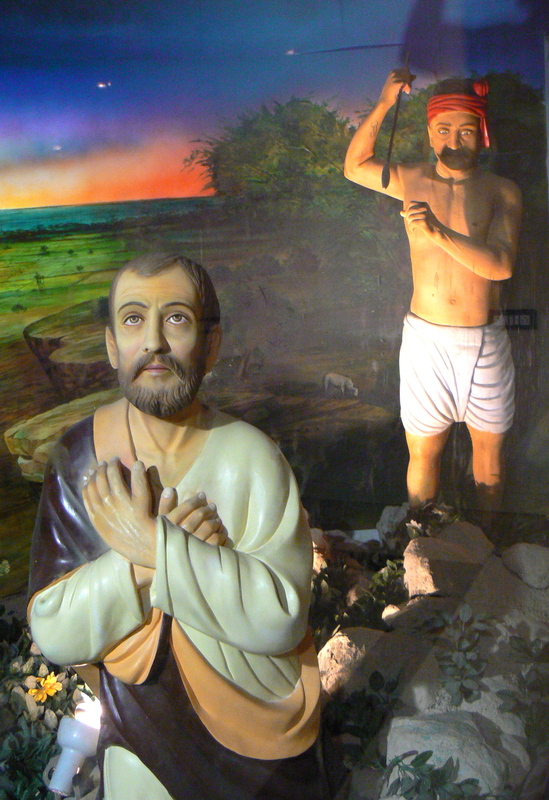 On 13 November 1952 the Vatican sent a letter to the Christians of Kerala stating that the alleged landing of St. Thomas at Muziris (Cranganore/Kodungallur) was unverified. 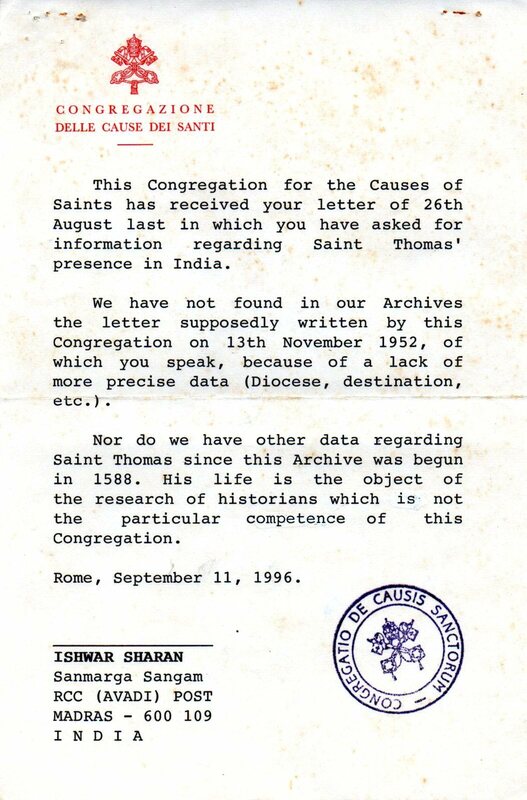 The Vatican chose not to confirm the sending of this letter to Ishwar Sharan in 1996 on the disingenuous grounds that he had not supplied them with enough information to locate it in their archives. In fact they could have given him a positive reply if they had wished to. Pope Benedict XVI has since stated in public that St. Thomas did not evangelize South India. This entry was posted in apostle, history writing, ishwar sharan, religion, st. thomas, thomas the apostle, Vatican Curia and tagged apostle thomas, christianity, cranganore/kodungallur, indian history, ishwar sharan, sacred congregation for the causes of saints, sacred congregation of rites, saint thomas, st. thomas apostle, thomas in india unverified, vatican, vatican letter to kerala christians 1952. Bookmark the permalink.